How does Microsoft's improved cloud filesharing and storage service stack up against the biggest names on the market? Consider a Dropbox fan's experience. Should SkyDrive Be In Your Cloud Mix? A confession: I kind of, sort of didn't know Microsoft's SkyDrive existed until recently, when the company's cloud storage and filesharing service began getting more attention amid the Windows 8 pre-launch buzz. It's been around in some form for a while, but I somehow missed it--even though I've always been Windows user, especially in business contexts, dating back to my first PC. Oops. I suspect I'm not alone in my ignorance. SkyDrive hasn't had anywhere near the brand recognition of Dropbox, Apple's iCloud, and other better-known platforms. With Microsoft's recent makeover of SkyDrive, now seemed as good a time as any to try it out. There are a few things about SkyDrive that caught my eye. Microsoft is giving away 7 GB of free space, which beats most of its competitors. That can quickly run out, but it's a fine starter package. Most of the stuff I'm going to store is relatively light: Documents, spreadsheets, and the occasional PowerPoint. Images are probably the bulkiest residents in my online storage accounts, though I tend to delete them once they've been shared or otherwise have served their purpose, backing them up locally instead. I don't typically handle much video or other large media files. My primary use cases are filesharing, mobility, and backup. The latter is a redundancy tactic--I'd rather not trust everythingto single cloud provider, but it rarely hurts to have an extra copy online if and when things go wrong in the office. My mobility needs, like a lot of other small and midsize business (SMB) users, have skyrocketed over the past couple of years. I have a main office but often work elsewhere, and not always from the same computer. Some of my curiosity stems from the fact that I'm running Windows 7 on my primary PC, a relatively new laptop. I have no plans to upgrade to Windows 8 when it comes out, or at any point in the foreseeable future. Given that SkyDrive will be more closely integrated with the newest versions of Windows and Office, I wondered if that made it a bad fit for me. Similarly, I'm not a Windows Phone user--would mobility be hampered on Android and other non-Microsoft operating systems? I also wasn't convinced that browser interoperability was a safe assumption; it seemed plausible that Microsoft might try to steer users to Internet Explorer, and I typically use Google's Chrome. I focused on Dropbox and Google Drive as comparison points for SkyDrive because they're the ones I currently use most often for both business and personal needs. There are, of course, plenty of alternatives out there. They include several that keep it strictly business, eschewing the consumer and crossover markets, for those paranoid about security and related issues. Google Drive, on the other hand, was sort of foisted upon me as a regular Google Docs user. I still tend to use it mostly as a function of Docs. It has already become sort of a disorganized mess, whereas I'm normally a neat freak when it comes to file management, online and off. I'm a Docs fan, and will likely continue to interact with Drive as a result--that's surely part of Google's strategy--but it has yet to convince me that I actually need it. Is there room for SkyDrive in the mix? Could it replace something I already use? Read on for the details, but here's the bottom line: I started using SkyDrive as a healthy skeptic with modest expectations. I'm going to keep using it after this initial tryout because I was pleasantly surprised. Perhaps I'm not yet a full-fledged convert, but it has been useful and is worth a long look if you're in the market for online backup and storage--even if it's just an "extra" on top of what you've already got in place. And if you're going to jump on the coming release of Windows 8, the case for SkyDrive is probably even stronger. I abandoned my Hotmail account in 2005. Rather than try to resurrect that login, I figured it was time for a fresh start. No great revelation here, but signing up for a new Microsoft account was easy. If you've already got one, you're a minute or two ahead of the game. Microsoft, as it should, adds layers of security protection here and elsewhere in SkyDrive. In this case, it was a simple verification email: "Call us overprotective, but we need to verify that [Email Address] is yours." Once you complete that verification, you're done. Sharing at the folder and file level is a snap, including sending stuff to non-Windows and non-SkyDrive users. If it wasn't, that would be a deal-breaker. The relative lack of brand recognition may hurt SkyDrive if you share files with a wide external audience, but that could begin to change if and when Windows 8 and Office 2013 drive increased adoption. And ultimately, that's not really a problem--but it'd be nice to not have to explain what SkyDrive is. Sharing at the folder and file level is a snap, including sending stuff to non-Windows and non-SkyDrive users. With Dropbox, I tend to use the desktop application much more than the Web interface, unless I'm traveling. Not surprisingly, SkyDrive's desktop app is pretty much the same thing--the familiar Windows Explorer file-and-folder system. They're identical, right down to the tiny green "check" icon that lets you know a file is synced. The installation was simple and fast, as it should be. One of the more interesting SkyDrive features--and the one that might give Microsoft the best chance at taking market share from some of its competitors--is its Office Web Apps integration. This gives you the ability to create, view, and edit Office files from within the Web version of SkyDrive. If you're running a supported version of Office, you can open a Web App file in desktop mode in a click of a button, or save the file locally. I'm not an Office 365 user, and usually opt for Google Docs if I want to create and work on documents online. But I am a regular user of the traditional desktop versions of Office and found the SkyDrive-Web Apps integration productive and relatively pain-free. It is one of the features that's likely going to keep me coming back. I don't have a ton of use for the Groups feature at the moment; email still tends to be the filesharing application I use most. But I see it as valuable in lots of SMB and virtual office scenarios. It's easy to use, and creating a custom email distribution and Group URL takes mere seconds. It's also one of those features that is rapidly becoming table stakes for business users. Given that SkyDrive, like Windows 8 in general, has a decidedly consumer-y feel, it was good to see that collaboration didn't get left out. I'm not sure SkyDrive yet packs a heavy-duty collaboration punch--those types of users are probably going to still go to SharePoint (or a competitor) for that, anyway--but the Groups feature makes it a viable way for smaller teams to stay connected. In general, I found the user interface clean and easy-to-use--which isn't always the given it should be. There's not a lot of clutter, extra links, upsells, and so forth. It does have some decidedly don't-call-it-Metro touches, even on Windows 7--but this is the general design direction Microsoft seems to be headed in. Pictured, for example, is the main menu, which will send you to other Microsoft applications. For a service like SkyDrive, it seems like the design rule to live by is: Don't screw it up. And they didn't, in my opinion. I especially liked being able to toggle between list and thumbnail views when looking at Files. There's no native SkyDrive app for Android users, which gave me pause--while I do most of my actual work on a PC, I want to be able to at least read and send files on my phone. That doesn't make me particularly unique these days. There are native apps for iOS and, of course, Windows Phone. That said, Microsoft features several third-party apps for using SkyDrive on an Android device. I tried Browser for SkyDrive (Free). As a number of Google Play reviewers note, it's not the prettiest thing. The jury's still out, but I wouldn't necessarily want to rely on this for regular business use. I found another free app, Android Explorer for SkyDrive, was easier to use and had a much cleaner interface. Android compatibility, while it exists, is an area where SkyDrive loses some points, particularly compared with Dropbox and Google Drive. Need more space? It doesn't take much to fill up 7 GB these days unless you're a diligent housekeeper or consistently light user. Like the other backup and storage providers out there, Microsoft will gladly give you more space for a relatively modest price. In fact, Microsoft is undercutting some of the established players--especially Dropbox. Adding 100 GB with SkyDrive will cost you $50 a year--that comes out to $4 and small change per month. Dropbox charges nearly twice that at $99 per year. (It also offers a monthly plan for $9.99.) That fits the generally aggressive pricing and upgrade offers for Windows 8 so far. 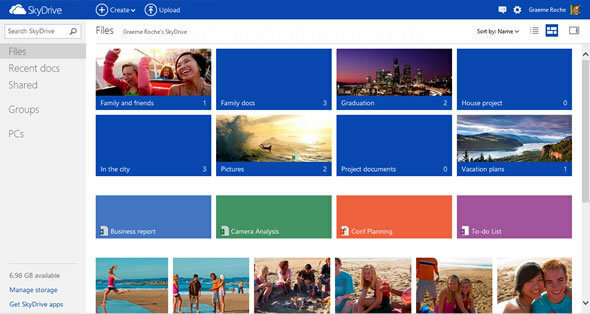 Currently, 100 GB is the largest available plan for self-service upgrade on the SkyDrive site, whereas Dropbox Pro provides 500 GB and Dropbox Teams offers 1 TB or more for workgroups. Google Drive charges $4.99 month for 100 GB. SkyDrive's pricing strikes me as a clear play for the consumer market, but one that will benefit SMB and bring-your-own-cloud users inside larger enterprises. Linked accounts are a hot security topic at the moment; you'll have to decide for yourself whether or not you're comfortable with the associated risks. But Microsoft does offer the requisite hookups to Facebook, Twitter, and Google, among others. This is actually a Microsoft account setting, rather than SkyDrive-specific. That merits mention because Flickr and Google are Windows 8 integrations, not SkyDrive connections. I don't have much use for linking SkyDrive to any of the sites currently offered--Google might be the one exception--so this wasn't an area of great concern. I suspect this list will grow for Windows 8 users, too. It's probably a safe bet that Microsoft will continue to invest in SkyDrive, particularly in terms of Windows 8 integration. Office 2013, for example, will save files to SkyDrive as a default setting. One feature I half-hoped to see already, but didn't, was optional Skype integration. In general, the current list of SkyDrive apps is a tad thin. It is interesting to note that there is a messaging module that features Facebook integration (pictured); it seems like Skype would be a natural fit here, given that Microsoft owns the platform. I was generally impressed by my early experiences with SkyDrive and am going to continue using it beyond this initial test. That's saying something, because it would be very easy to walk away at this point. I am mildly concerned that future improvements and functionality, particularly on the apps front, will be laser-focused on Windows 8 and related applications, and won't offer much benefit for Windows 7 users. That would be a problem because a lot of the filesharing and storage platforms start to blend together for garden-variety use cases, so the apps and integration points help as differentiators. If I'm wrong and Microsoft doesn't ignore Windows 7 users on this front, SkyDrive might become I service I regularly rely on.